Starting from DbVisualizer 9.1 evaluation of the Pro edition is requested from within DbVisualizer. 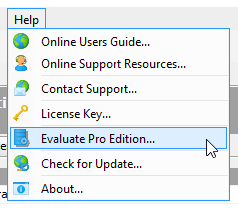 Just open the Help menu and chose Evaluate Pro Edition to get started with the trial. Please note that the 21 day evaluation license for DbVisualizer Pro is for non-commercial use only, as per our EULA. The 21 day license can be extended, subject to our approval and based on the information you provide when requesting an extension. If you wish to use DbVisualizer Pro for real work your options are to get a personal, commercial license for DbVisualizer Pro or to settle for the limited functionality Free version.